THEN he tried to find his way straight across the garden, but he became more and more puzzled. Presently, he came to a pond where Mr. McGregor filled his water-cans. A white cat was staring at some gold-fish; she sat very, very still, but now and then the tip of her tail twitched. 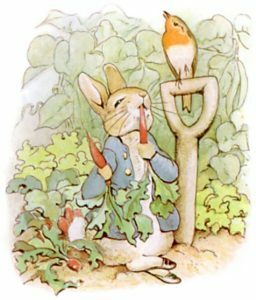 Peter thought it best to go away without speaking to her; he had heard about cats from his cousin, little Benjamin Bunny. HE went back towards the tool-shed, but suddenly, quite close to him, he heard the noise of a hoe. Peter scuttered underneath the bushes. But presently, as nothing happened, he came out, and climbed upon a wheelbarrow, and peeped over. The first thing he saw was Mr. McGregor hoeing onions. His back was turned towards Peter, and beyond him was the gate!